Friends look on as Mickey and Purple exchange vows on the space net. Mickey Wilson has a flair for the dramatic. Wilson, the Colorado slackliner who rescued a skier who had caught his backpack on a chairlift at Arapahoe Basin last January, married his girlfriend, Purple McMullen-Laird, in a wedding ceremony Aug. 26 that was the first of its kind — on a space net accessed only by slacklines. The ceremony took place in the Fruit Bowl just outside of Canyonlands, Utah. 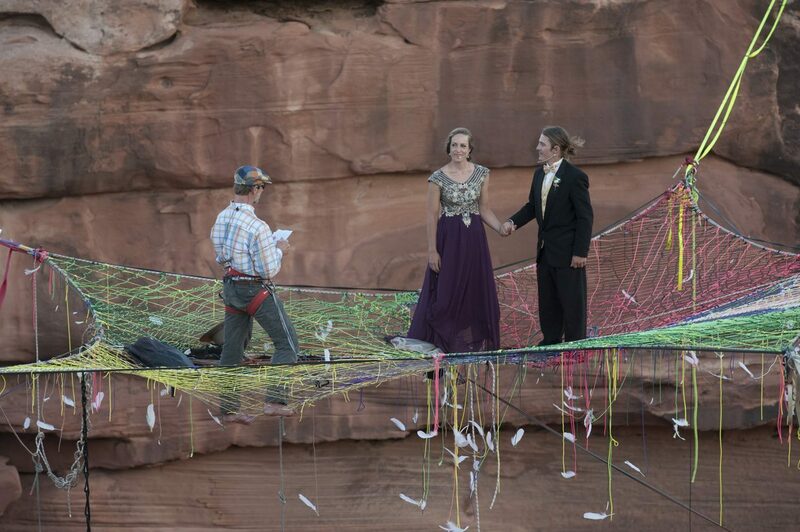 More than 100 people gathered around the rim of the canyon to watch Mickey, Purple and Tim, the officiant, walk out on slack lines to a space net constructed by Purple suspended more than 300 feet above the canyon floor. At the conclusion of the ceremony the couple dropped over 200 feet through a hole in the center of the net on a rope swing to begin their lives together. This week the couple heads to Hawaii for an all-expenses-paid honeymoon that was given to them by the Ellen Degeneres Show when Wilson appeared on the show shortly after the rescue. Shortly after the rescue, Wilson wrote a moving account about the incident, its aftermath, and life lessons learned.